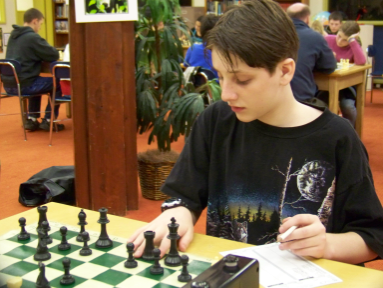 The Portland Chess Club hosts a four-round G/60 tournament one Saturday per month. The tournaments are OSCF qualifiers, but usually about 3/4 of the participants are adults. Scary? Nah… Well, scary for the adults maybe. In a match-up between a 10 year old and an adult 100 points higher rated, I’d put my money on the kid–like 4th grader Liam Booth (1252 USCF) beating Gregory Markowski (1457). Other Oregon scholastic players participating were 8th grader David Wen from Cheldelin Middle School in Corvallis, 10th grader Steven Witt of Century High School (Hillsboro), 6th grader Venkat Doddapaneni of Stoller Middle School (Portland), and 6th grader Valentin Molchanov of Bethany Montessori (Portland). 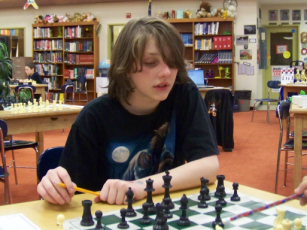 The powerful Portland area high school chess league has completed three rounds of play. In the upper division Gavin Megson of Clackamas High School and Nathan Ryan have both been a perfect 3/3 so far. Nathan (928 NWSRS) had to notch a 400 point upset in the third round to keep his streak in tact, but he proved that he was up for the task against Joel Porter (1358) of the strong Lake Oswego team, which won the OHSCTA high school team championship last year. Several other players have perfect scores after playing two games:Alex Piatski, Alexander Schoen, and Charles Earp. Alexandra Botez (1941), fresh off her outstanding performance against a tough field at the World Youth Championships, is also at 2/2, including a win against Fred Litt (1726) who played on board #1 on last year’s state champion Lake Oswego team. In the lower division, three players from Jesuit High School (Bryce Eng, Christopher Dimarco, and Tushar Sah) are alone at 3/3, emphatically stating that JHS is a force to be reckoned with. 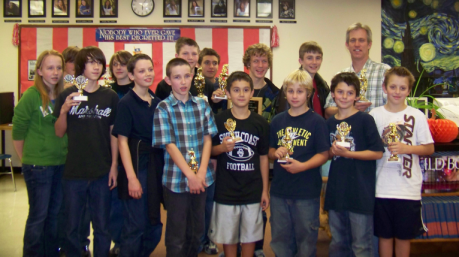 November 20, 2010, despite threats of snow in the passes, the Southern Oregon Chess League held a tournament at the Coquille High School. Coquille Varsity and Coquille Junior Varsity chess teams once again showed their dominance in the region with Sutherlin and Oakland participating. Marshfield and Myrtle Creek were unable to participate. For the Coquille Varsity team, none of the other participating teams could snag a win off any of the five members. Jessi Ross, Tasha Keller, Stephen Mast, Jasmine Lambson and Jenni Ross won all their games placing Coquille clearly in first, Myrtle Point second and Sutherlin third. For the Coquille Junior Varsity team, the only loss they suffered was against Oakland where Sarai was defeated on her board as she “dropped” a piece but the other four members, Aaron Grabinsky, Kaden Johnson, Tyler Neuschwander and James Hopper got all wins during the three matches. Coquille placed first, Oakland second and Sutherlin third. 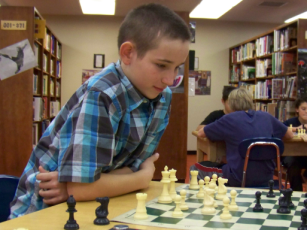 Saturday, November 13th, at the Byron Massey Memorial Chess Tournament held at the Coquille High School, players strived to emulate the sportsmanship that Massey had displayed in past chess tournaments. Kaitlyn Davidson displayed a cheerful attitude despite adversity and loss. Matthew Crim complimented his opponent who had just lost, telling him that he had given him a challenging game. Amanda Davidson reassured her opponent to take all the time he needed to think over his moves and after losing, was cheerful. Tyler Overby and Dane Ramirez always had a smile despite losses. Many players made sure to compliment their opponents, shake hands and everyone was smiling despite the game results. But one player, Devin Kruse from Grants Pass, exemplified Massey’s sportsmanship as he helped his first opponent record moves for the first time, encourage another beginner player as he let his opponent know he was making good challenging moves and shared his juggling pins and balls that were a hit for entertainment between rounds. Although he never got the chance to meet Byron Massey, he had heard the tales and was “deeply honored” to receive the award. Those who did know Byron had tears as the sportsmanship plaque with Byron’s portrait was awarded. 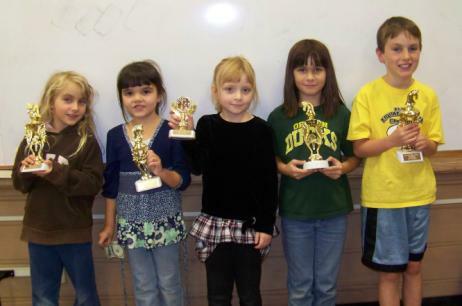 Six elementary players tested out their chess skills from kindergarten to fourth grade in age. Jed Wright dominated the division as he won all his games, getting 1st place for 4th grade. Izabella Sperling won 1st place for 3rd grade and Gracie Wright won 1st place for K-1st grade. The 6th grader to adult section was divided into Elite and Upper division base on ratings. In the upper division, adult Steve Goldman from Medford and Devin Kruse, 10th grader from Grants Pass predominated the event with 3.5 wins out of 4. Coquille’s Tyler Neuschwander (7th grade) and Myrtle Point’s Matthew Crim (9th grade) were just behind them with 3 wins out of 4. Coquille’s Mason Collard won first place for 6th grade. In the elite section, Medford’s Collin Goldman and Roseburg’s Kareem El-Badry tied with 3.5 points to win the first place cash prize. In the younger elite section, Aaron Grabinsky 7th grade of Coquille placed first and Josiah Perkins 5th grade of Coquille placed second. Players were evenly matched and games were tight and intense through this event that lasted till 7 p.m. as most games went the full one and a half hour time limit. Elementary Division Winners: Gracie Wright, Angie Morones, Mackenzie Collard, Izabella Sperling and Jed Wright showing off their trophies. Amanda Davidson of Coquille playing chess while her daughter Angie Morones hangs out under the table after competing in the elementary division. Welcome to the new OSCF website! The look is the same but the functionality has expanded to include more information, easier access, and more interactive features. 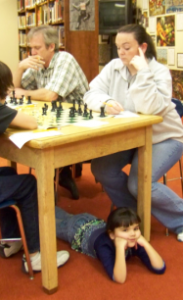 On the main page, look for up-to-date news from Oregon, US, and world chess and post your comments. On the Resources menu, you can find annotated games by great masters and future masters alike. Send in your own favorite tournament games for publication. Or send in your annotations of great master games. You can also find thousands of puzzles ranging from pretty easy to very difficult. On the Tournaments menu, please note the item for “Teams.” OSCF is tentatively planning a chess team state championship for some time in 2012. Go to the link and add your input about format, timing, site, etc. One of the niftiest features on the old website was the online registration program. We are working on a new one that will be even more easy to use, more powerful, and (perhaps most importantly) more secure. It’s not yet fully operational. Contact us for more information. On the Resources menu, read official rules for bughouse, blitz, Chess960, and lesser known variants such as suicide, bomb chess, and ninja chess.